Is the Win7 64-bit or special in any way? Did you try an plain MS Win7 32-bit ISO extracted to a USB drive? How about creating a virtual HDD, mounting the HDD, copying the USB stick to the virtual HDD, dismounting it, then boot from it via VBox? I made some changes to the way a VirtualBox VM is started. There are now 3 independent ways to start it: exe parameters, VM ID and VM Path. Default is VM ID. In the previous version there were only the first 2 and they were not 100% independent. On Qemu, since it uses only exe parameters, the other 2 are hidden. In the next few days I won't be able to work much on this program because I won't have a computer. A close friend of mine has a damaged video card in his computer and I will borrow mine to him until I could find a second hand one. He can't afford a new one and he needs a working computer (for good reasons). A close friend of mine has a damaged video card in his computer and I will borrow mine to him until I could find a second hand one. It seems like - strangely enough - Norwegian is more similar to Latin languages than to English. The same verb is used, active or passive? It is this way in Italian, and latin languages. In English there are two different verbs, to lend (as in "I will lend mine to him") and to borrow (as in "He will borrow mine" or He will borrow it from me"). Good luck in your search for the fast affordable PC . Actually I'm not 100% Norwegian, I was just born in Norway and sometimes I live there. Nothing important, I was just curious about the language. Lucky me, looks like the damaged video card still works but only in 800x600 resolution and 4 bit color depth. With anything higher the monitor goes to standby. Even so I have some weird colored lines on my screen. I'm interested in your opinion: should I modify the code to identify the USB drive by its serial number (to avoid the problems when other drives are connected/disconnected before it's connected) or I should just use the current code (the number)? Do you mean the device serial number or the Disk Signature or the Volume Serial? I mean the device serial number. If you remove it from its physical surface that's no problem, my program will not ask you to type it. It will automatically take it from its chip when you will select the device from the popup menu. I am talking of the "unique" serial that is attributed to the stick with it's Mass Production Tool. In the above example, I left it, but I have more than one stick where I removed that info. Ok, I think that you're talking about the same thing as I was. Just curious, why do you remove it...? Do you reset it to 0 or do you write another unique SN? Anyway, I could use also other characteristics, like Capacity (total not volume), VID, PID, Controller model, Flash Vendor, Flash ID ad so on. I happen to do things just to annoy someone else (not really-really , only to prove a point if needed ). I happened a few years ago to come across an app (BTW actually and IMHO useless and worthless) that recorded (besides and outside the Registry) the serials (and some other data) of any USB stick connected to the machine. It was a "corporation" and the IT guy thought that it was "1337" to deploy that to all the PC's, and tried to "sell" this idea as a security enhancement/auditing fail-proof method , so I made quite a few sticks with Serial 9341963742831649 to see how long it would have taken him to find about it. Then took the habit when re-configuring a stick (I tend to "flip the Removable bit" on my sticks) to set it's serial to all 00's. Why dont' you use the Disk Signature like anyone else? Solved the video card problem, I bought an old GeForce 6200 FX with only 12 Euro. Disk Signature could be the solution. Thank you for the idea. I found a good way to retrieve the disk signature using Delphi code and I intend to implement it. But if anyone wants the drive number implementation instead, speak now. Like the priest says "If anyone objects to this marriage, let them speak now or forever hold their peace.."
if the idea is to uniquely identify a device, why not use disk sig+USB serial no+drive capacity? Yes, it will raise the "uniqueness" from, let's say, 99% to 99.9%. The only downside is that the program will be a little more slower and a little more unstable. But I think that's not such a big problem. It seems like there is a problem retrieving the disk signature on GPT disks. I can't find any good and documented API function for this. Cannot you just get 4 bytes with direct disk access to first sector of the device? I mean, a non-GPT aware NT based system has anyway to "identify" the disk using Disk Signature, so when you connect such a disk to a 2K (and possibly also XP) it must write to it a Disk Signature. the issue might be a a GPT disk that was only mounted on newish Windows NT versions. But if you use the "standard code" you can have Disk Signature on MBR disks and "DiskId" on GPT ones. And as well if you use direct disk access you can get the 4 bytes on sector 0 offset 440 or the 16 bytes on sector 1 offset 56. Yes, I know this function, seems good, for the past 2 days I'm trying to make it work in Delphi and couldn't find a way because I can't find any documentation about setting it in Delphi. Thanks for the tip, I will modify the code to see if I can get the GUID from the GPT disks (from that location). For now I implemented only with disk signature. It performed great in tests. But if, in the future, there will be duplicates problems, I will implement also with serial number and capacity. With Qemu is adapting perfectly to any change in physical disks order. 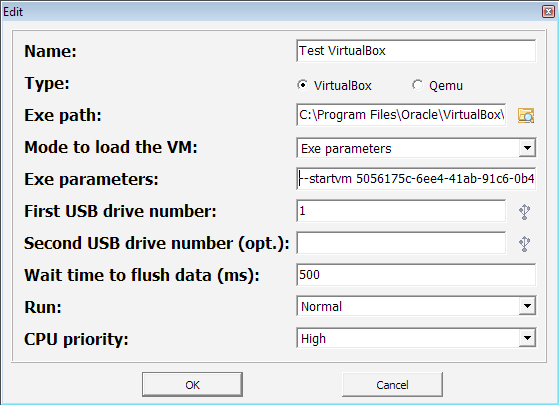 With VirtualBox only half because the automatic change of usb.vmdk is not yet implemented. Btw, should I detach usb.vmdk, rebuild it and attach it again (kind of slow but less potential problems) or should I just change the number of the \\.\PhysicalDrive inside the file (faster but rare problems may appear)? In the past few days I've worked hard to implement the automatic modification of the vmdk HDD file(s) (pointing to the USB drive(s)). - when the vmdk file is already attached to the VM it modifies its content: drive capacity, drive number and the number of cylinders. Btw, a curious thing about the number of cylinders: it seems that the maximum number (generated by the vboxmanage) is 16383 (although the VM doesn't show error if you increase it manually). And since it always uses 16 heads and 63 sectors it means that the maximum (geometric) size is 7.8745 GB. - when it doesn't find the vmdk file attached, it creates one for that USB drive and attach it to a fixed port number (0). 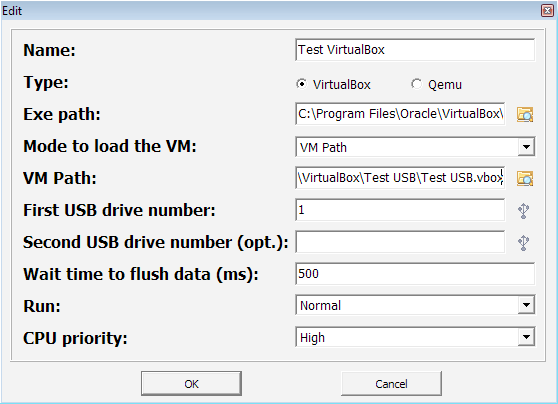 - the removal of the vmdk for the second USB drive when it's removed also from the VMS entry. LE: link removed, you can find a better version in the next posts. Not quite sure how to use your GUI... How is one meant to set up the initial VM for VBox before selecting it in your app? First - is it possible to copy the existing vbox rather than add drives and change an existing one - i.e. user selects existing vbox but you write a copy and temporarily change it and boot to that? One of my vm's has a USB.vmdk+hdd1+hdd2 as storage, when I used your app and added first USB drive, it added USB1 to the other 3 drives and then wouldn't boot due to IDE drive config issues. The addition also meant that the VM that previously worked fine in VM Manager now doesn't (until I delete the extra added drive). So I presume I need to create a VM without a USB vmdk already attached. The First USB drive list is listing drives F and H, but F is my internal SSD HDD not a USB drive. One of my VMs ("USB2 Boot") had a snapshot. 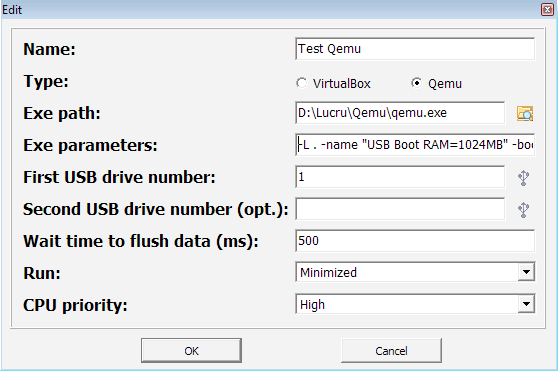 The list of .vboxes in your app seemed to be not listing that one, but another vbox (called 'test iso') seemed to have the ID number of the "USB2 Boot" VM and it booted to the USB2 Boot VM when I ran 'test iso' from your app. Once I deleted the snapshot, your app listed the USB2 Boot VM. Might be best if you gave unique names to the .vmdk's you create, just in case they clash with existing ones - e.g. VMStart_USB1.vmdk? I haven't implemented complete creation and/or control of the VirtualBox VM. You just have to create a machine with default settings or use one that is already built. Most will work ok with my application and I will improve it when someone will show me a commonly used VM that doesn't work. Just send me the VM files and/or the VB configuration file(s) and I will try to solve the problem. - I wouldn't call VirtualBox a bug free application so each time you will use the internal commands to copy the VM elsewhere, register it and so on, this will increase the chances that something would go wrong. - like I said, my application doesn't have complete control of the VM, I implemented as much control as it was needed to add/modify/delete the vmdk file(s), the rest requires user interaction with the VM (in the VirtualBox interface); some users will not like finding a duplicate of the VM. Strange, it should of worked even with a vmdk previously attached. Could you please send me the this vmdk and the vbox file so I can try to duplicate the issue...? Maybe even some data about the USB drive (capacity). Yes it's listing internal drives also because I haven't implemented a code that would differentiate USB drives from internal HDD's. Reason: not all the USB drives are seen as "removable" by the OS and not all the internal ones are seen as "fixed"; sometimes even the users "flip" the "removable" bit. Let me tell you something amusing: when I first installed Windows XP on my internal SATA WD, it was seen as "removable" but my external WD HDD was seen as not "removable". I fixed with my internal HDD but I let the external one to be seen as internal. Hmm, seems like a bug. Could you please recreate the problem and send me the vbox file and "c:\Documents and Settings\Username\.VirtualBox\VirtualBox.xml" (this is a Windows XP path, some of the folders in the "tree" are virtual in 7/8). My application uses usb0..usb99. It checks before creating another vmdk and uses another number in that range. So the probability of a clash is very little. But I will use "VMSusb0..99". Later edit: using VMS to atart a VM with snapshot is generally not such a good idea anyway. 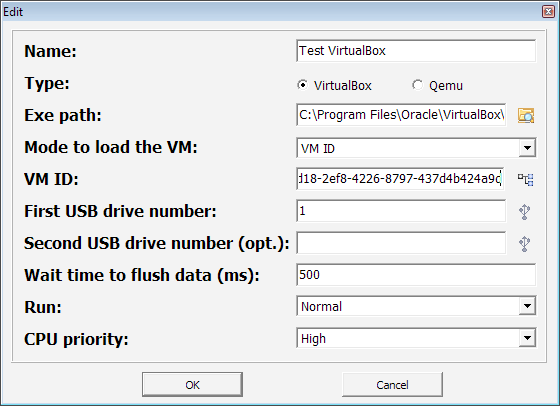 The main gold of VMS is to make writes on USB drive visible; the snapshot is making the VM write into a file on HDD. 1. Are you using the latest VirtualBox version (4.2.12)? 2. I've seen that some programs (WinSetupFromUSB and probably your program too) use WMI to get data about USB drives. It's good but the problem is that is restricted to Windows (WMI = Windows Management Interface). Other OS's have very poor WMI implementation. For example I tried to use WinSetupFromUSB in wine (Linux), it's not even showing the interface before crashing.